A few things I’ve found interesting this year were that Medco reached out via their PR group to engage me and several other bloggers in the space. And, Prime Therapeutics has always been very active in engaging me around my thoughts on their report (see comment from last year) and continued to be proactive in discussing it with me and sending me a hard copy to read on the plane. If you don’t know, Prime works with 17 BCBS plans who are either owners or clients. They managed $9.1B of drug spend in 2009 and had 15M members. Their overall trend was 3.4% which is good. Everyone’s trend was generally low this year although I continue to question if this is the right metric for the industry. I also wonder if they will embrace the outcomes based rebating that Eric did with Merck at Cigna. Early on they talk about one of the ways they manage trend being through adherence and not manufacturer programs. I might be out on a limb here, but I believe manufacturer funding on adherence programs (especially in specialty) is a good thing. They are always quick to point out that they report drug trend across their entire book of business not a random set or using any other cut of the data. They share some early analysis looking at medical claims where they identified that 1/3 of people with diabetic complications had no recent diabetes prescriptions. A gap-in-care intervention opportunity. They also shared a study that I hadn’t seen published that members using a 90-day supply of medication (retail or mail) were 40% less likely to stop taking their drugs than those using a 30-day supply. That’s a big difference. Interestingly they source a study saying that their members get Rx refills a day faster than competitors. Again, that’s a big difference. They talk about their MAC list (Maximum Allowable Cost) which is used to manage the cost of generics in the payment terms with the retailers. They are the only PBM that I’ve ever seen do this. 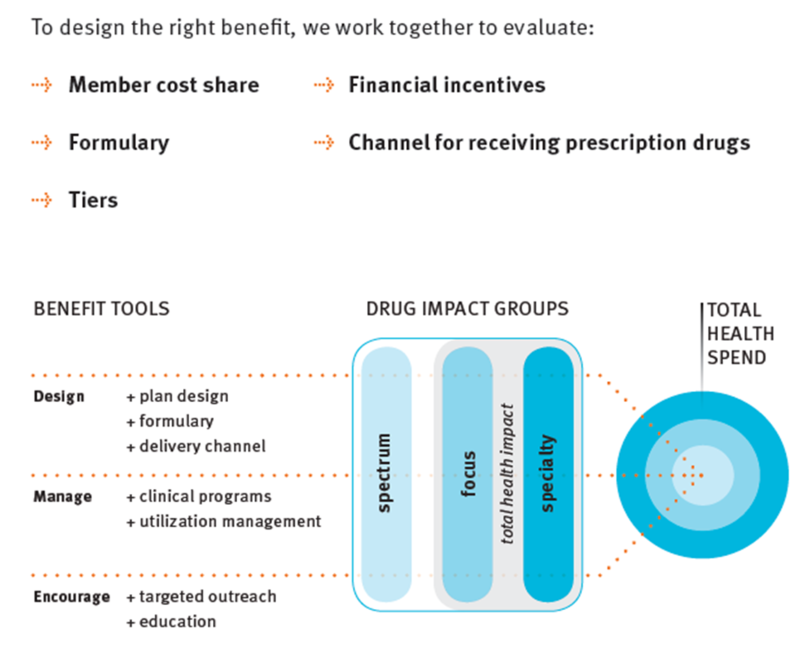 They talk about the need to establish out-of-pocket (OOP) maximums for higher cost drugs. I AGREE! They (like others) discuss the impact of rising drug prices primarly around brand products. I had an interesting discussion with a reporter at the NY Times yesterday on this where he talked about manufacturers essentially paying the entire copay (20% of a $100,000 drug) to keep it getting filled. They projected that the GFR (generic fill rate) would exceed 70% by the end of 2010 which I suspect will happen (if it hasn’t already). It was interesting that they layout their pharmacy benefit for their employees. That would be an interesting one to come across PBMs. How do they treat their employees? What do they recommend? Do they take their own advice? Specialty medications had a 13% trend while representing less than 1/2 percentage of the overall prescriptions processed…but they did account for 12% of the cost. Prime’s members filled 11.8 prescriptions per year (2.5% increase in utilization). Prime’s Medicare trend was -5.6% with utilization of 48.2 Rxs PMPY. The average age for their Medicare lives is 73 (compared to 33 in the commercial lives). As I’ve talked about before, I like the way they break out their “Focus” drugs which are drugs used to cover diabetes, high blood pressure, high cholesterol, respiratory disorders, and depression. These are categories with clear value propositions around adherence and are often co-morbidities. 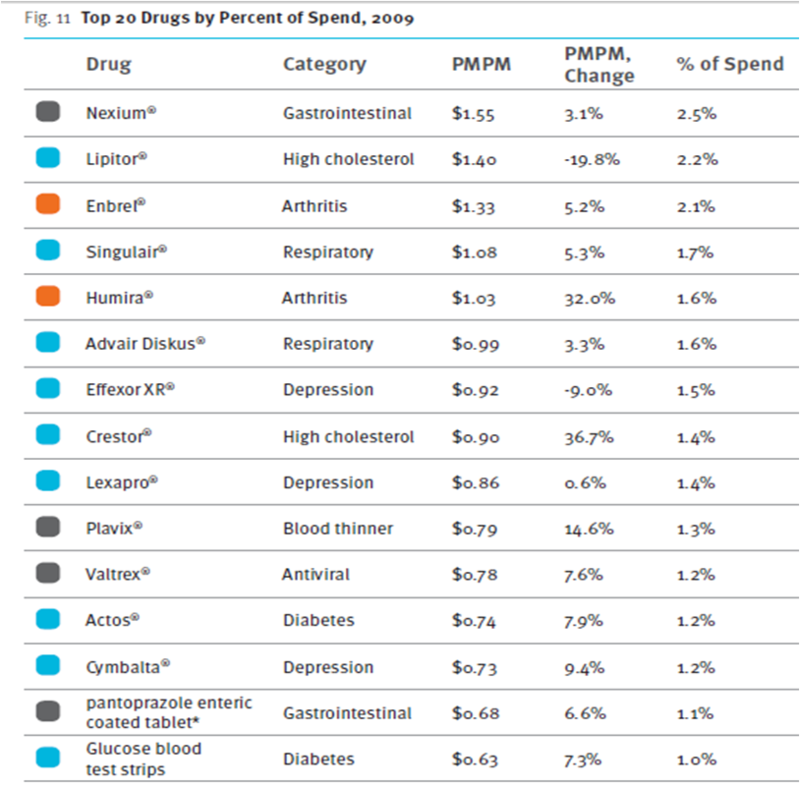 The average specialty drug cost $2,117.07. 7 in 10 Americans die from chronic illness. As many as half of all patients don’t adhere to their prescription regimens. More that $100B is spent each year on avoidable hospital admissions due to non-adherence. Adherence to high blood pressure treatment alone could prevent 89,000 premature deaths in the US annually. I’m still a big fan of step therapy in this category using OTCs then H2s then generic PPIs then brand PPIs, but I know step therapy with OTCs can be a pain. Specialty drugs accounted for 21% of the $300B in 2009 drug spend (National)…by 2030, it’s estimated that specialty will account for almost 50% of drug expenditures. They share the research from PhRMA that there are 861 drugs in the pipeline for oncology. They talk about value-based benefits when MPR is less than 80% for diabetes, high blood pressure, and high cholesterol. I’m good with this as long as it’s not selectively offered to just those with low MPR (i.e., rewarding those who aren’t taking their medications). They talk about requiring prior auth (PA) before a non-preferred drug is dispensed. Does this mean the formulary is essentially closed? They talk about using co-insurance to deter the use of brand-name and non-formulary drugs. I’ve always been a skeptic here since the patient doesn’t know the cost of the medication so I believe that flat copays are much easier to understand the difference, but there might be research that I’ve missed on this one. They talk about reaching out to MDs on generic utilization. This should work but is tough. I had an academic detailing team at Express Scripts and a generic sampling team. I’d love to know what the success rate was and if MDs impressions of generics have changed over the past 5 years. For tiers, they share data that suggests that the copay savings needs to be $25.50 per month for a patient to choose a generic over a brand (and I might assume one brand over another). As they point out, that’s much larger than the $13 difference which exists today. Sorry, but you must not be one of their customers. Since my Blue Cross plan switched me from Caremark to Prime, I’ve had nothing but problems. The total cost for my meds is twice what it was at Caremark. It takes three weeks to get a prescription, instead of the one week with Caremark. Their customer service is horrible. I have only filled seven prescriptions with them so far and every one has been a disaster.